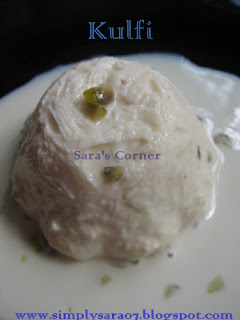 Lovely kulfi... looks perfect and delicious.. beautiful clicks !! kulfi looks yumand adding coconut is a great variation. Yum yum kulfi,a family favourite.Loved it. Kulfi looks delicious, i love the coconut inthem. heavenly n yummy yum..do participate in my ongoing event.. wow! !kulfi looks perfect saras...surely will try it. Wow,I like this tasty kulfi very much. Very Yummmmmmyyyyyyyyyyyyy.